◾The woman who was asking for donations for the charity was as phony as a three-dollar bill. ◾My brother’s such a cheapskate that he cuts his hair himself. ◾To be fair at the end of dinner, we decided to go Dutch and paid together. ◾We’ll have to tighten our belts when I retire. ◾Greece joined EU because they thought it was a gravy train. ◾Sorry, we don’t accept credit cards. This is strictly cash-and-carry. ◾It’s hard to make a living as a journalist these days. ◾The little boy had sticky fingers and was always taking small change from his mom’s wallet. ◾I have a little nest egg that I’m saving for college. ◾I am going to ask for a pay rise. I am tired of working for peanuts! ◾She’s poor as a churchmouse, so you can’t expect her to donate anything. ◾My sister is deeply in debt because she is living beyond her means. ◾When you flip a coin, what is the chance of guessing heads or tails correctly? ◾The former CEO left the company with a golden handshake worth £300000 after ten years in the job. ◾Fiona doesn’t know anything about working for a living; she was born with a silver spoon in her mouth. ◾My brother can’t save anything, money burns a hole in his pocket. ◾His life story is an excellent example of going from rags to riches. ◾We paid through the nose to get the house repaired and the roof is still leaking. ◾After my brother was born my dad took a second job just to make ends meet. 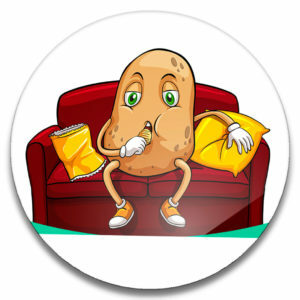 ✔“Couch potato” — малоподвижный человек, почти все время смотрящий телевизор. Someone who often engages in sedentary activities, usually understood as frequently watching television. ◾Lisa wants to date a man who loves to travel and explore, not a couch potato who watches television all the time. ✔“Hot potato“ – щекотливая тема. A sensitive situation or controversial issue that is difficult to handle and thus gets passed from one person to the next(like a potato that is too hot to hold). ◾The political candidate knew the issue was a hot potato, so he deferred to his chief of staff, who directed questions to the committee chairperson. ✔“Drop (someone or something) like a hot potato“ – отступиться, перестать что-либо делать. To abandon someone or something suddenly and completely, sometimes to avoid potential problems. ◾I haven’t seen Cynthia in weeks because she dropped me like a hot potato once the cool kids befriended her. ◾We dropped our renovation plans like a hot potato after finding out how much the job would cost. Something or someone insignificant; small fry. ◾This contract is small potatoes, but it keeps us in business till we get into the real money. ◾Small potatoes are better than no potatoes at all. ✔“Meat and potatoes“ — простая еда, простые вкусы. Basic simple and good food, simple tastes. 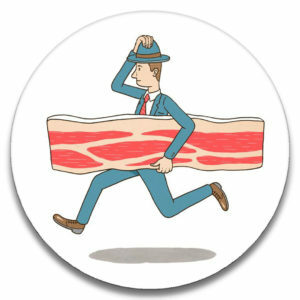 ◾The man is a meat-and-potatoes person who enjoys the simple pleasures of life. Advise — это глагол, который на русский язык чаще всего переводится как советовать, рекомендовать. 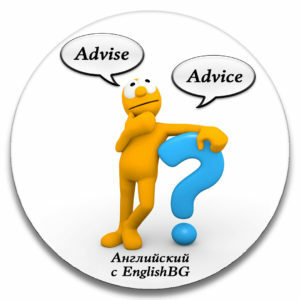 Advice — существительное, которое обычно переводится как совет или консультация. Учитывая, что эти слова звучат практически одинаково (особенно когда говорят быстро) и имеют похожее написание, не удивительно, что люди часто их путают. Используйте «especially», если хотите выделить одного человека, предмет, место или ситуацию из нескольких. «Specially» используется в значении «для особого случая», «по особой причине». Harry despises his PE lessons, especially when he has to play football. (Гарри ненавидит уроки физкультуры, особенно когда ему приходится играть в футбол). A chocolate cake was made specially for Amy’s birthday. (Шоколадный пирог испекли специально ко дню рождения Эми). ✔Big cheese – большой босс, шишка. An important, successful, or influential person. ◾Jacob thinks he’s a big cheese now that he’s been promoted toassistant manager. 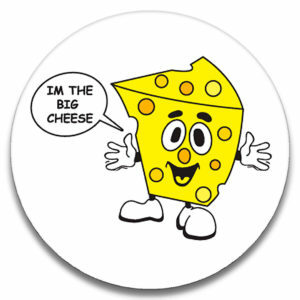 ◾I’m the big cheese around here, so you have to do what I say. ✔Say cheese! – скажите чиз, улыбнитесь. Smile for the photograph (or literally say the word «cheese,» which will result in one’s mouth forming a smile). ◾OK, everyone, look at the camera and say cheese! ✔Be chalk and cheese- быть совершенно разными. To be very different from one another. ◾Good luck getting those two to talk to each other they’re like chalk and cheese. ◾My daughters are chalk and cheese these days—one loves baseball and the other loves ballet. ✔To “cheese (someone) off” – вывести кого-то из себя. Is to anger or disgust someone. ◾I don’t think I said anything to cheese him off, so I’m not sure why he’s so mad. ✔To “cut the cheese” – испортить воздух. ◾I can’t believe you cut the cheese in the car. Now we have to smell it all the way home! To alternate значит чередоваться, an alternative — это вариант. Когда вы носите клетчатый пиджак, черные и белые квадраты чередуются (alternate). Слово alternate может быть существительным, глаголом или прилагательным, что и осложняет жизнь. Several, including alternates, have taken notes and kept lists of evidence. So it went on all day—heavy showers that lasted for a few minutes alternating with brief, bright intervals. The alternate jersey will have an interlocking SD on the left chest. Alternative может быть прилагательным или существительным. В качестве прилагательного оно переводится как альтернативный, другой выбор, в том числе альтернативный образ жизни. Как существительное, это слово означает-альтернативу — выбор из двух и более вариантов. Some harriers have evolved an alternative lifestyle — cross-dressing. Люди часто говорят alternate , когда они имеют ввиду alternative, может быть, потому, что это слово короче. Никто не будет ругать вас, если вы перепутаете эти слова, но постарайтесь не допустить путаницы. Сегодня у нас слова conscience и conscious. Оба слова имеют отношение к сознанию, но важнее быть conscious, или другими словами быть в сознании, чем conscience, или осознавать правильность и неправоту. Оставайтесь в сознании, слушая моральную дилемму вашего друга, и вы сможете использовать свою совесть, чтобы дать ему хороший совет. Conscious означает осозновать себя или окружающий мир. Это слово также означает, быть чувствительным к чему-то или бодрствовать: Witnesses say he was bleeding profusely but conscious and talking. He was even horribly conscious of a slow pallor creeping over his face. Conscience- это нравственное понимание, совесть, внутреннее чувство правильного и неправильного. Если бы вы были в мультике, ваша совесть была бы тем маленьким ангелом на вашем плече и говорила бы вам что правильно (и советовала бы игнорировать маленького дьявола на другой стороне). They went out guiltily, as men whose consciences troubled them. Passports are not required, but a social conscience probably is. Чтобы различать эти слова, запомните- в слове conscience две N, а в слове conscious одна. 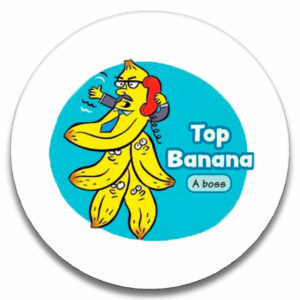 ✔“top banana” is the leader. ◾His plan was to be top banana within ten years. ✔“second banana” is a subordinate. ◾I’ve been second banana in this company for too long now. I’m going to start up my own business, and then I’ll be the one in charge! ✔“banana republic” is a weak or corrupt country. ◾The dictator’s insistence that the tiny island nation double down on its dominate export has made it even more of a banana republic. ✔to “go bananas” is to become excited or crazed, to go mildly crazy. ◾Sorry, I just went bananas for a minute. I thought he was going to go bananas. ✔to “drive (someone) bananas” is to annoy or irritate someone. ◾That noise will drive me bananas. ◾I refuse to listen to any more of your childish banana oil. ✔“banana-head” is a stupid person. ◾Ask that banana-head why she is wearing a coat like that in July. ✔“banana hammock” — a bikini for a male. ◾He was wearing a little yellow banana hammock that drew a lot of stares. ✔to “slip on a banana skin” — an action that results in an unforeseen and embarrassing mistake or problem. ◾When Joe applied the latest software update, he had no idea what a banana skin it would be until after his company’s entire network crashed. ✔“one-banana problem” is a problem, project, or task that requires little to no effort, expertise, or intelligence to solve or complete. ✔to “make like a banana and split” — humorous slang To depart or leave, especially at once or in a hurry. ◾This carnival turned out to be really boring. Come on, let’s make like a banana and split!